Art of Field Recording: Volume IThe sampler CD for this set was released in 2006 with the thought that the final result would be a five' disc set, but after spending a long time with Art pondering the vast quantity of material he has amassed over the years, we decided to extend the release into multiple box sets. Volume I was released in November 2007, and Volume II is planned for 2008. If all goes well, there will be a third and final installment in 2009. 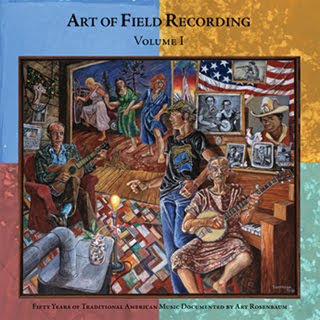 Art of Field Recording Volume I is a four disc set with a 96 page book that contains essays and annotations by Art and over 100 illustrations and photographs by Art and his wife Margo. Art took a similar approach to Harry Smith in assembling the music: the discs are divided into Blues, Instrumental and Dance, Sacred, and a Survey disc that has a little bit of everything. Sally Ann - W. Guy Bruce and Guy Bruce Jr. I hope I don't seem cheap,but r-share won't give this file unless I buy a premium account. It's my luck that I already have 3 accounts with other hosts. Would you consider adding alternate link? If not I will go for the premium account.I always was curious to hear these. Thanks for your excellent site. Thanks for dividing up the files!! THE MONKS - Mega - Post! !